It's chilly outside, which means it's officially soup season. Lucky for you, we've got two delightful new recipes -- one you can make on the stove in minutes, and one set-'n-forget slow-cooker creation. It's ladle time! Prepare bacon in a skillet sprayed with nonstick spray or on a microwave-safe plate in the microwave. (Refer to package for cook time and temperature.) Chop or crumble and set aside. Toast bread slice and gently rub both sides with cut sides of garlic clove halves; discard clove halves. Cut bread into 1-inch squares and set aside. In a nonstick pot over medium heat on the stove, cook and stir chopped tomato until softened, about 3 minutes. Add tomato soup and stir. Bring to a low boil. Stir in spinach and cook until wilted, about 2 minutes. Serve topped with bacon and garlic-toast squares. If you like, top with sour cream. Yum! Spice up your life with a bowlful of this hearty soup! Flavor, fiber, and all that protein -- poultry power! In a slow cooker, combine broth, beans, corn, bell pepper, onion, chipotle peppers, soymilk, garlic, and cumin. Stir well. Season chicken with salt and black pepper and place in the slow cooker. Cover and cook on high for 3 - 4 hours or on low for 7 - 8 hours. Transfer chicken to a bowl. Shred with two forks -- one to hold chicken in place and the other to scrape across the meat and shred. Stir shredded chicken into the soup in the slow cooker. Stir in potato flakes, sour cream, and cilantro. Enjoy! HG Alternative! Skip the chipotle peppers for a deliciously mild chicken chowder. 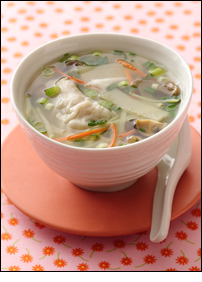 Thai-Oh-My Coconut Chicken Noodle Soup and What's Shakin'? 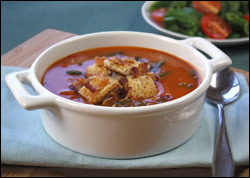 Beany Bacon Soup - Two ultra-flavorful and filling soups. They want to be a part of your lunch or dinner -- let them! 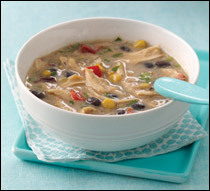 Hungry Chick Chunky Soup - Our chicken soup will feed your soul without feeding the rest of you too many calories. Cheesy Broc Star Soup - One of the easiest soup recipes we've got! Try it ASAP. Tell your buddies that soup is ON -- click "Send to a Friend" to pass along the recipes! January is National Soup Month... which, in all honesty, is why we gave you soup recipes today. Plus, we love soup. And really, who doesn't?